Intel's Sandy Bridge architecture was introduced to desktop users more than a year ago. Server parts however have been much slower to arrive, as it has taken Intel that long to transpose this new engine into a Xeon processor. Although the core architecture is the same, the system architecture is significantly different from the LGA-1155 CPUs, making this CPU quite a challenge, even for Intel. Completing their work late last year, Intel first introduced the resulting design as the six-core high-end Sandy Bridge-E desktop CPU, and since then have been preparing SNB-E for use in Xeon processors. This has taken a few more months but Xeon users' waits are at an end at last, as today Intel is launching their first SNB-E based Xeons . A completely improved core, as described here in Anand's article. For example, the µop cache lowers the pressure on the decoding stages and lowers power consumption, killing two birds with one stone. Other core improvements include an improved branch prediction unit and a more efficient Out-of-Order backend with larger buffers. A vastly improved Turbo 2.0. The CPU can briefly go beyond the TDP limits, and when returning to the TDP limit, the CPU can sustain higher "steady-state" clockspeed. According to Intel, enabling turbo allows the Xeon E5 to perform 14% better in the SAP S&D 2 tier test. This compares well with the Turbo inside the Xeon 5600 which could only boost performance by 4% in the SAP benchmark. Support for AVX Instructions combined with doubling the load bandwidth should allow the Xeon to double the peak floating point performance compared to the Xeon "Westmere" 5600. The access latency to PCIe I/O devices is not only significantly lower, but Intel's Data Direct I/O Technology allows the PCIe NICs to read and write directly to the L3-cache instead of to the main memory. In extremely bandwidth constrained situations (using 4 infiniband controllers or similar), this lowers power consumption and reduces latency by another 18%, which is a boon to HPC users with 10G Ethernet or Infiniband NICs. The new Xeon also supports faster DDR-3 1600, up to 2 DIMMs per channel can run at 1600 MHz. Last but certainly not least: 2 additional cores and up to 66% more L3 cache (20 MB instead of 12 MB). 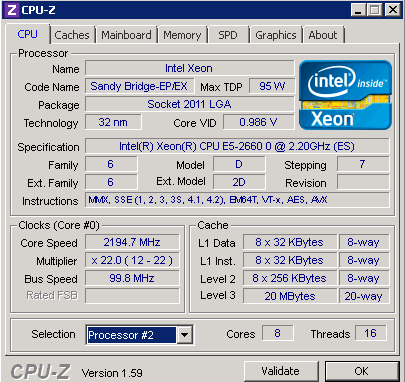 Even with 8 cores and a PCIe agent (40 lanes), the Xeon E5 still runs at 2.2 GHz within a 95W TDP power envelope. 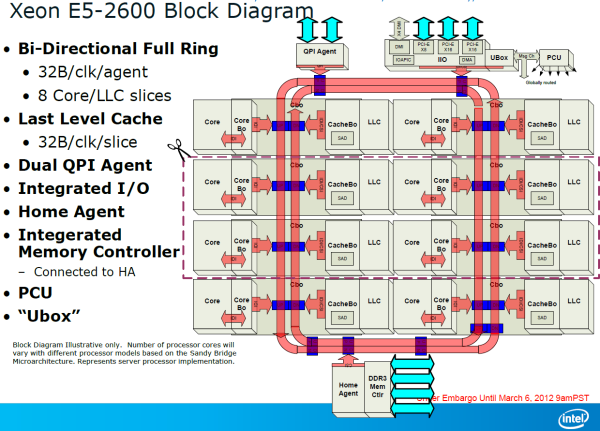 Pretty impressive when compared with both the Opteron 6200 and Xeon 5600. Second page, in the Intel table, the 2630 is listed as an eight core CPU. How do celebrities keep fit and be always on top? Simple, complete with exercise and of course the right diet. In Hollywood it every day a new diet is devised that promises weight loss in a short time and a fabulous body. From the fasting diet to that of the Paleolithic, up to that of the blood type, the stars follow them a bit 'all. Do you want unlimited gems, gold and elixirs without spending money? You can enjoy free gems by using the Clash Royale Hack with the latest version, easy to use with proxy support. With such a feature, you can truly enjoy yourself in the game and complete things you want without much trouble. This will make your time spent playing either less hard work and more fun. This is why we recommend our tool for all enthusiasts of the video game.